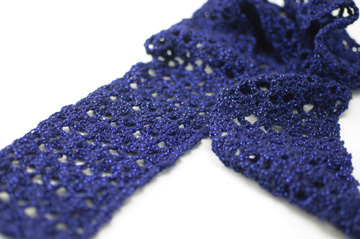 Put a little “glamour” into your life with the shimmer of the yarn used in our Glamour Scarf. Made with just one skein of Vanna’s Glamour yarn, it works up quickly so you can wear it (or give it) in no time! The pattern includes full written instructions, as well as a symbol crochet chart, for those who prefer a visual representation of the project! This scarf pattern is available separately, or as part of our One-Skein Scarves pattern, containing all 3 scarf patterns (Pediwick, Autumn Romance and Glamour) for a special price. Note: Photographed model made with Lion Brand Vanna’s Glamour in #109 Sapphire.